What’s the deal with Ice King’s crown? Why did Simon Petrikov gain magical abilities when he put it on, and why did it drive him insane? “Evergreen” answers these questions with a flashback to prehistoric Earth, revealing that the crown was created to be a weapon that would destroy the comet threatening the planet’s current population of dinosaurs and evolved elemental beings. Falling somewhere between these two lifeforms is Gunther, a green dinosaur that had his brain mutated by the magical ice elemental Urgence Evergreen, and tragedy strikes when Gunther gets the opportunity to be a hero for the first time. 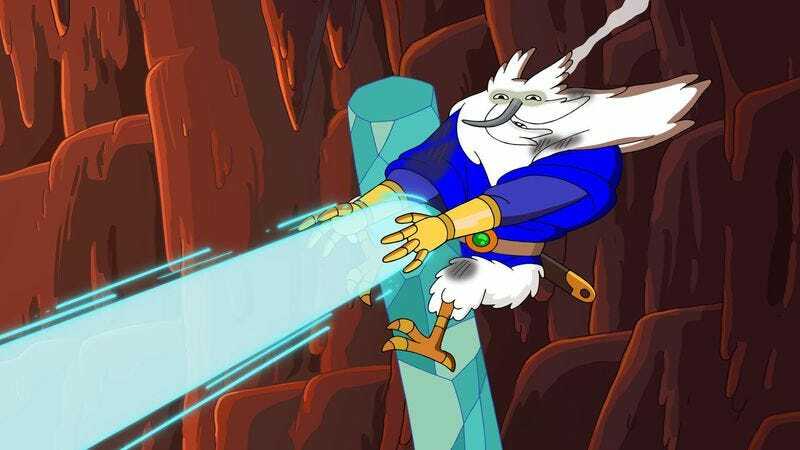 Like “The Vault,” “Evergreen” spends almost its entire runtime in the past, dialing back the clock to show the Adventure Time universe at a primordial stage in its existence. Instead of Finn and Jake, the action follows Gunther and his cat-like companion Nina, who serve the will of Evergreen. This is one of those rare episodes that doesn’t feature Finn or Jake in any capacity, and the transition from the final shot of Finn and Jake in the title sequence to Gunther and Nina on the episode’s title card is a clever way of indicating this shift in focus before the story begins. Nina is a much more passive partner than Jake (which is saying something after Jake’s hilariously inactive characterization last week), and this episode is really about Gunther and his relationship to the titular character. Pamela Adlon carries the majority of the story’s dramatic weight as the voice of Gunther, and she whips out a voice belonging to another naïve, passionate young man to bring the naïve, passionate dinosaur to live. If you close your eyes, you can easily imagine this episode as an elaborate dream in the mind of King Of The Hill’s Bobby Hill, which isn’t a bad thing at all. Adlon’s Bobby Hill is a perfect adolescent male voice, with a scratchiness that gives the impression that the character is caught in the wild throes of puberty. We have no idea what Gunther’s age is, but his voice suggests that he’s caught between youth and adulthood. He wants to be a magical adult like Evergreen, but he’s still a kid that can’t completely handle responsibility. Evergreen doesn’t want to teach his assistant any spells because he doesn’t think Gunther is ready for magic, and ultimately that reluctance to teach is what leads to the demise of Evergreen, Gunther, and everything else on prehistoric Earth. Adlon is just one of the great guest stars in tonight’s episode, which also includes Alan Tudyk as the candy elemental Chatsberry and Keith David as the fire elemental Balthus. David is especially hilarious, bringing immense gravity to absurd lines of dialogue. One line has him breaking down the four elements of Adventure Time’s universe, and his totally serious delivery of “fire, ice, candy, and slime” makes the sentence all the funnier. These characters are faced with the end of life on their planet, but the direness of their situation is undercut by humor. The drama intensifies when Evergreen decides to go through with his magical crown plot against the wishes of his fellow elementals, but it’s balanced by the inherent humor of fart sounds, which emanate from Chatsberry’s hands as he shoots a barrage of jellybeans to protect himself. Steve Wolfhard is credited as co-writer and storyboarder artist, but “Evergreen” is Tom Herpich’s baby, and like past episodes spearheaded by a single artistic voice, it’s a standout chapter of the series. Adventure Time has become a show that is not only impossible to predict, but constantly growing in scope, and this week’s episode drops viewers in the middle of a new setting with new characters, adding a new twist to this season’s ongoing narrative while providing new information about one of the show’s most mysterious, and powerful, objects. The keyword is “new,” and a major part of the thrill of “Evergreen” is seeing fresh characters and environments introduced to the show’s mythology. These flashback stories provide a bevy of new design opportunities, and this episode introduces some striking new characters in the elementals. 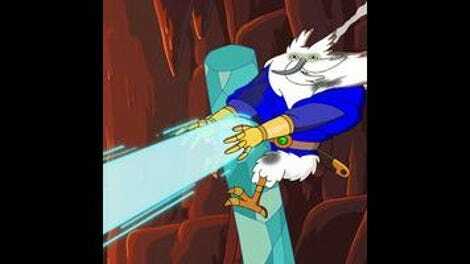 Evergreen’s appearance immediately connects him with Ice King, but there’s a fullness to Evergreen’s shape whereas Ice King is more deflated. Evergreen’s design contrasts heavily with Gunther’s very basic anthropomorphized dinosaur look, and those dramatic visual elements are a way of signifying Evergreen’s elevated status. The plain Gunther wants nothing more than to be a spectacular being like his mentor, and that’s why everything goes wrong. The colors in this episode are phenomenal. The palette begins with dark earth tones that set a strong point of contrast for the bursts of bright color that appear as the elemental characters take larger roles, separating these fantastical characters from their surroundings by having them pop against a drab background. The coloring intensifies as the episode continues, and moments like Evergreen’s battle against the ancient lava dog Magwood are given greater impact thanks to the clash of hot and cold colors on the screen. A sickly green blankets the screen whenever the comet is in view, creating an uneasy atmosphere that foreshadows the disaster to come when Gunther puts on the magical crown. Evergreen was warned about the dangers of wish magic by Chatsberry at the start of the episode, and the crown only works as a weapon if the wearer’s deepest desire is truly to destroy the comet. If Evergreen was the person that put the crown on, the prehistoric world could have potentially been saved, but when Gunther is left as the Earth’s last defense, the purpose of the crown becomes something completely different. As evidenced throughout the episode, Gunther’s deepest desire is to become Evergreen, and when he puts on the crown, he undergoes a transformation that fries his synapses. He could have protected himself if he was taught some spells, but he never learned any magic and is left completely vulnerable to the wild effects of the crown’s phantasmal circuitry. When be puts on the crown, he starts to shout “No Gunther!” over and over, taking on Evergreen’s disdain for his assistant as his first new character trait. Eventually Gunther’s body morphs to resemble Evergreen, granting the dinosaur his wish just in time for him to be incinerated by the comet that he fails to stop. “No Gunther!” resonates through time and haunts Ice King’s dreams, an unfortunate side effect of losing his mind to the crown’s influence, and the episode ends with Ice King jumping on his bed and screaming the ancient Gunther’s last words while his penguin friends look on in terror. That conclusion would be effective enough, finishing the story with an unnerving look at how life choices have unforeseen consequences way down the line, but the final shots of “Evergreen” deliver a plot twist that raises the stakes for future episodes. As Ice King asks why his Gunthers are looking at him all weird, the screen cuts away to outer space, where another comet is barreling toward Earth. When is it going to make impact? Can the crown be reprogrammed to stop it? “Evergreen” gives viewers answers about the past, but it also introduces new questions for the future, using a magical accessory to build an intriguing chapter in Adventure Time’s ongoing narrative. I love that candy and slime are two of Adventure Time’s fundamental elements. I guess earth and air just aren’t that important in this world. Slimy-D the rapping slime elemental does not get nearly enough screen time in this episode.